June 28, 2017 – It’s mid-April 2017 and NOAA’s GOES-16 Field Campaign, a two-month-long effort to calibrate and validate the earth viewing instruments on NOAA’s GOES-16 satellite, has officially entered its second phase. As storm clouds gather, excitement in the field campaign operations center grows. The call was made the evening before. There is going to be a mission this morning— a hunt for lightning. As dawn breaks over Alabama, the sky settles into a cloudy steel-gray. Looming over the University of Alabama in Huntsville’s (UAH) Severe Weather Institute Radar and Lightning Laboratories, otherwise known as the SWIRLL building, it’s the kind of sky that warns of rain. Inside the SWIRLL building, NOAA’s GOES-16 Field Campaign Operations Center is abuzz with activity, excited by the impending storms. It’s mid-April 2017 and the GOES-16 Field Campaign, a two-month-long effort to calibrate and validate the earth viewing instruments on NOAA’s GOES-16 satellite, has officially entered its second phase. For the last month a team of instrument scientists, meteorologists, and specialized pilots have used a high-altitude plane, ground-based sensors, and satellites to collect and compare measurements from across the United States. With life-saving warnings and revolutionary weather data on the line, it is imperative that this campaign succeeds. NOAA’s newest and most advanced weather satellite must be as accurate as possible. As storm clouds continue to gather over the SWIRLL building, the excitement and anticipation in the operations center bubbles. The call was made the evening before. There is going to be a mission this morning— a hunt for lightning. After a brief delay, the mission’s meteorologists decide the weather is finally setting up the way they’d hoped and the “go-ahead for take off” is given. 230 miles away at Warner Robins Air Force Base in Warner Robins, Georgia, a veteran NASA high-altitude pilot and his aircraft are already prepping for flight. A mission briefing is conducted, the instruments are loaded and checked, the plane is fueled, and the pilot dons his pressurized flight suit. 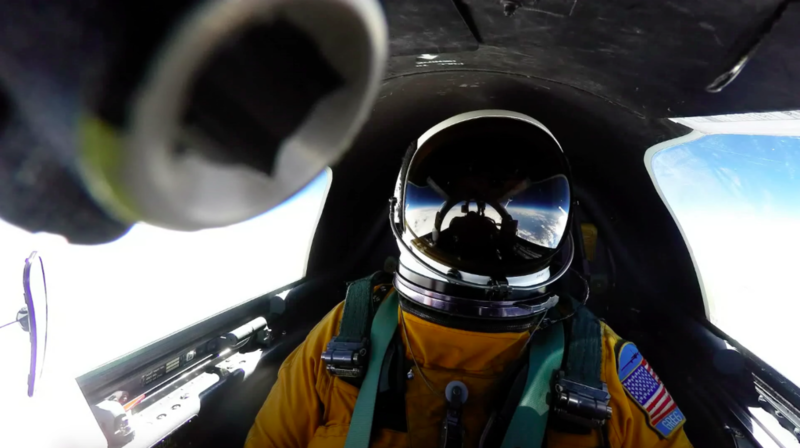 At 11:00 a.m. CDT, the NASA ER-2 high-altitude aircraft leaps from the runway and begins its climb to 65,000 feet above the planet. In a matter of minutes, it is hurtling northwest to begin six hours of validation data collection. For the last 24 hours, teams of NOAA meteorologists, researchers, and several UAH graduate students have been watching an array of computer monitors, carefully planning today’s mission. Positioned in a darkened conference room, they click through scores of computer displays, each showing a different weather model, map or data set. As they jump from screen to screen, they debate convection rates and initiations, short wave troughs, and cloud formations, always aware of the ticking clock on the pilot’s time in the air. For this mission, the scientists are looking for one thing: isolated, low-flash-rate thunderstorms with compact lightning flashes. Throughout the campaign, the ER2 optical lightning detectors have observed over 10,000 lightning flashes, but this is a special mission to get a specific type of flash during a storm’s initiation. This second phase of the GOES-16 Field Campaign is focused on collecting lightning flash data to validate NOAA’s brand new Geostationary Lightning Mapper (GLM). This instrument, the first of its kind ever developed for operational use, will measure total lightning (in-cloud and cloud-to-ground) and lightning flash rates from 22,000 miles away. 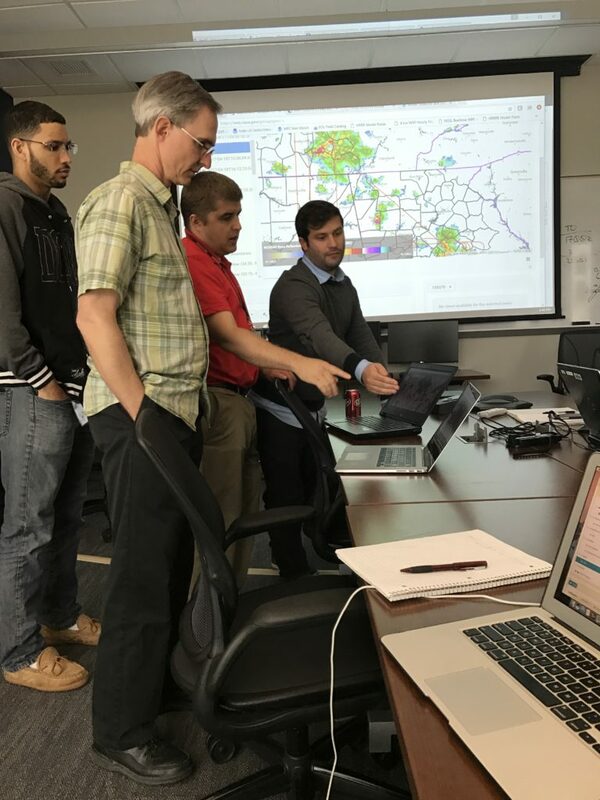 Once precisely calibrated and validated, GLM, in concert with other forecaster tools, will help provide more accurate and earlier warnings of developing severe storms and give communities more time to prepare for impending severe weather. If the scientists can clearly measure a lone, well-defined lighting flash with the plane’s instruments, the GLM, and various ground sensors, they can perform an important “one-to-one” comparison to hone in the GLM’s detection threshold, or sensitivity, for light. This is a crucial component of the satellite’s calibration. Both GOES-16’s GLM and the Fly’s Eye GLM Simulator (FEGS), which observes lightning from beneath the plane, utilize the optical portion of the electromagnetic spectrum, or visible light, to identify lightning. Nearly every other ground-based lightning mapping system currently in use measures in a different portion of the spectrum. Isolated lightning during a storm’s initiation is sporadic and fast moving making catching it from above no easy task. Most meteorologists will tell you forecasting severe weather is as much of an art as it is a science. Predicting where and when major storms will occur is akin to an improvisational dance featuring inputs from models, sensors, and weather satellites with more than a touch of tried and true experience mixed in. Add the constantly depleting mission flight time and fuel with limited instrumentation and multiple mission objectives, and you have an impressive balancing act on your hands. As the pilot careens across the sky, UAH graduate student Austin Clark, Team Lead for Field Campaign Student Forecasters, notices a new storm kicking off over Tennessee. The GOES-16 mission scientists briefly confer and soon call the pilot with new coordinates. The room waits quietly as the thin orange line tracking the plane displayed on the mission monitor begins to curve towards the new storm. While data from the all-important FEGS, the instrument designed over the last three years specifically to mimic and calibrate GOES-16’s GLM, cannot be reviewed in real-time, the scientists are carefully monitoring other instruments which can be, like an electric field-change meter. Mounted to the airframe, this meter will show changes in the electromagnetic field within roughly 20 miles of the plane and alert the instrumentation team to a possible detected lightning flash. To these scientists, to NOAA, and to the world, this campaign is more than just an effort to fine-tune a new satellite. It’s a mission to calibrate one of the most advanced pieces of weather technology ever produced. The eyes of the global weather community are looking to NOAA and the GOES-16 Field Campaign Team to lead the way in next-generation geostationary satellite validation. GOES-16’s instruments will be some of the best-characterized and validated instruments put into operational use. Next-generation geostationary satellite operators in Europe, Japan, South Korea, and China are taking careful note of the campaign’s results and never-before-seen data to better validate their own satellites, benefiting weather forecasting around the world. In fact, the European Organization for the Exploitation of Meteorological Satellites is actively participating in the campaign by contributing data from a deployed ground-based lightning mapping network using sensors of the type that will be used in Europe with the hopes of establishing better validation processes for their own future satellites. With 60 minutes left in the mission, time is running out. The scientists and pilot continue to chase quickly dissipating storms. While still gathering valuable secondary data for validation, they have yet to conclusively capture their elusive compact lightning. 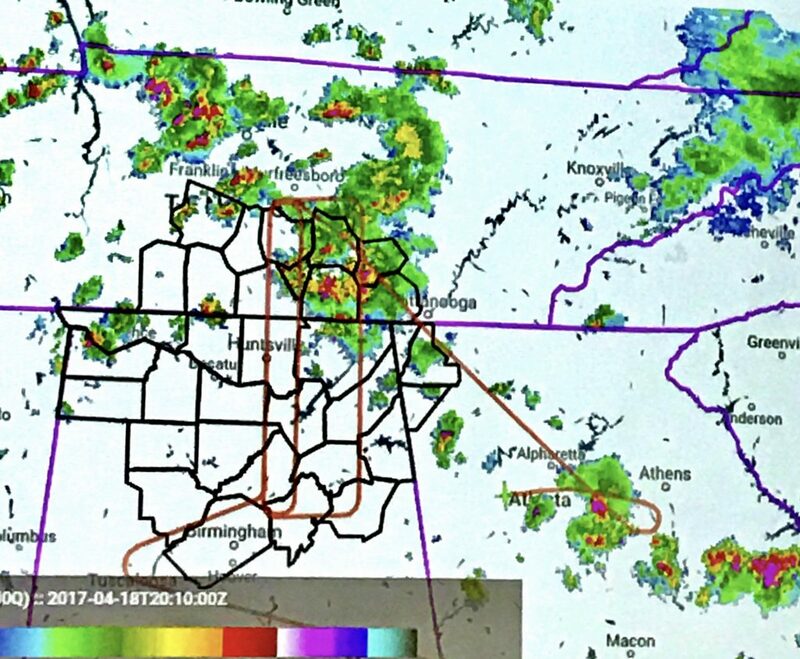 A new fairly aggressive storm cell kicks off over Nashville, Tennessee. While promising, the team is forced to carefully consider their next step. They must calculate “travel-to” and “return-to-base” times against the odds of overflying a lightning-producing storm. New models, maps and, data are thrown onto the screens and the weather is again carefully scrutinized. A decision is made and the team decides to throw a lightning “Hail Mary” over Nashville. As the plane changes course and the orange line again bends, the instrumentation team is called up on speakerphone. Everyone watches quietly as the pilot sets up his pass. He crosses over the storm, performing several fly-overs, before a voice on the phone finally breaks the silence. “We have triggers! I definitely think we got something.” – Dr. Mason Quick, the FEGS instrument primary scientist reports. The plane’s electric field-change meter and several lightning mapping array systems on the ground begin recording flashes throughout the remaining 30 minutes. As the plane turns toward base, it continues to measure lightning activity all the way back. Using expert forecasting, skilled flying, and a touch of luck, the team has checked off another major primary mission objective. It doesn’t hurt that “Chained to the Rhythm” by Katy Perry, the project manager’s unofficial good luck song, is now quietly playing in the background. This is just one mission and one objective out of nearly 100 hours of available flight time. The campaign must calibrate and validate many of the performance capabilities of GOES-16’s GLM, as well as its primary instrument, the Advanced Baseline Imager. With the campaign ending on May 17, 2017, there is still much more work to do. The data must be thoroughly catalogued, vetted, processed, and analyzed. In fact, throughout its operational life, as other campaigns are conducted and data collected, GOES-16 will be continually fine-tuned. It will also serve as a vital reference point for its successors, GOES-S, -T, and -U. This is just one step in GOES-16’s future as the world’s most advanced operational geostationary weather satellite.